"Dark Magician" + 1 Dragon-Type monster. Must be Fusion Summoned with the above Fusion Material Monsters or with "The Eye of Timaeus", and cannot be Special Summoned by other ways. If this card is Spe..
Target 1 Beast-Type monster in your Graveyard; Special Summon that target, and if you do, all face-up monsters your opponent currently controls lose 200 ATK for each Beast, Plant and Winged-Beast-Type.. When an attack is declared involving a Fusion Monster you control and an opponent's monster: That monster you control gains ATK equal to the ATK of the opponent's monster, until the end of the Damage .. When a monster you control inflicts 1500 or less damage to your opponent by a direct attack: Discard your entire hand (min.1); excavate the top card of your Deck, and if it is a Monster Card, send it .. When an opponent's monster declares an attack on a "Blackwing" monster you control: Banish all face-up Attack Position monsters your opponent controls. If you control exactly 3 "Blackwing" monsters (a.. If you control a "Blackwing" monster other than "Blackwing - Oroshi the Squall", you can Special Summon this card (from your hand). You can only Special Summon "Blackwing - Oroshi the Squal" once per .. 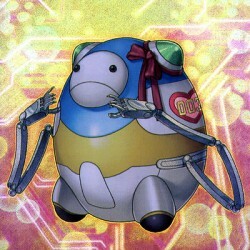 If this face-up card leaves the field: Special Summon 1 "Steam Token" (Aqua/WIND/Level 1/100 ATK/100 DEF). If this card is in your Graveyard: You can Tribute 1 monster; Special Summon this card from t.. If this card battles a FIRE monster, during damage calculation: This card gains 1000 ATK, during damage calculation only. You can banish this card from your Graveyard; Special Summon, from your hand ..
(This card is always treated as a "Noble Arms" card.) The equipped monster gains 500 ATK. When this card is sent from the field to the Graveyard: You can target 1 "Guardian Eatos" you control; it gain.. When your opponent's monster declares an attack: You can Special Summon this card from your hand, and if you do, change the attack target to this card and proceed to damage calculation. This card cann..
"Dark Magician Girl" + 1 Dragon-Type monster. Must be Fusion Summoned with the above Fusion Material Monsters or with "The Eye of Timaeus", and cannot be Special Summoned by other ways. Once per turn,.. When an opponent's monster declares an attack on a face-up Attack Position monster you control: Make your opponent's attack a direct attack instead and inflict damage to your opponent equal to the ATK..
During either player's Battle Step, when a Fusion Monster you control battles an opponent's Fusion Monster: Target both those Fusion Monsters; negate the attack, and if you do, each player takes damag.. When this card in your possession is destroyed by your opponent's card (either by battle, or by card effect) and sent to your Graveyard: You can target 1 monster they control; destroy that target, the.. Cannot be Normal Summoned/Set. Must be Special Summoned by its own effect, and cannot be Special Summoned by other ways. If a "Guardian Eatos" is destroyed by battle or by card effect and sent to your.. If you have no monsters in your Graveyard, you can Special Summon this card (from your hand). You can send 1 Equip Spell Card equipped to this card to the Graveyard, then target up to 3 monsters in yo.. When this card in your possession is destroyed by your opponent's card (either by battle, or by card effect) and sent to your Graveyard: You can target 1 Spell/Trap Card they control; destroy that tar..
During the End Phase, if this card was Normal Summoned this turn: You can Tribute this card; excavate the top 5 cards of your Deck, you can add 1 excavated Spell/Trap Card to your hand, also send the ..
Pay 2000 Life Points and Tribute 1 Warrior-Type monster; banish up to 3 "Legendary Dragon" Spell Cards with different names from your hand and/or Graveyard, and if you do, Special Summon that many "Le.. Cannot be Normal Summoned/Set. Must be Special Summoned with "Legend of Heart", and cannot be Special Summoned by other ways. When this card is Special Summoned: You can target 1 face-up Spell/Trap Ca.. When this card is Normal Summoned or flipped face-up: You can target 1 "Orbital 7" in your Graveyard; Special Summon that target in face-up Attack Position or face-down Defense Position. Once per turn..